Whenever people talk about great Manchester United players they will mostly come up with the name of a player who has taken up a very special position for the club. The winger. Despite having possessed great players in every position like Bobby Charlton, Eric Cantona, Roy Keane, and Wayne Rooney, there is no secret that width has always been the forte of Manchester United. Players like George Best, Steve Coppell, Ryan Giggs, Andrei Kanchelskis, David Beckham and Cristiano Ronaldo, many of which have been mentioned as great players of the game in one way or another, have all marvelled the wing for the Red Devils. However, since the great Portuguese left for sunny Spain we have witnessed a change of guards and tactics. Despite having more than decent players in Nani, Valencia, Young and Park, the variety amongst them make United the massive force they are. They have all got the individual skill to take a team apart, but looking deeper into it you notice exactly how Sir Alex manages to get the best out of them for the team. The great Manchester United teams of the past have all had a solid base of a regular full-back to partner the winger. In 1999 we had Gary Neville and Beckham, Irwin and Giggs, and in 2008 there was Wes Brown and Cristiano Ronaldo doing the damage down the right. But in latter years squad-rotation has taken over, and that applies to every position. Especially on the wings. When you have got four different players to occupy two positions squad rotation is necessary, but how does Sir Alex manage to change United’s biggest offensive threat so often without ruining the chemistry? Answer? Change full-backs when you switch wingers. Ever since the Da Silva twins arrived in 2008 the right-back position has been under severe rotation. Gary Neville, John O’shea, Wes Brown, Phil Jones, Chris Smalling and both Da Silva twins have occupied that position at different times since then, but one combination is solid. If one of the Brazilian twins are fit whenever Antonio starts, they are going to play. Those two offer a combination which brings the best out of each other. There is no coincidence that neither Rafael nor Fabio featured a lot when Valencia was injured at the start of this season, or last, but then suddenly appeared when he got fit again. When Antonio arrived at United during the summer of 2009, Gary Neville was still right-back at United and for the first couple of months it was those two who featured most regularly. What happened was that Valencia had cut inside more often, and in December he had already scored more goals for United than what he had for Wigan in the past 2 years. Valencia is a winger who likes to stay wide, hug the touchline and sniff the white chalk, but with Neville’s attacking play being more based on overlapping on his outside Valencia had to get more narrow and closer to goal. However, when Neville picked up an injury later that month it was Rafael who came in. What happened was that Valencia started to get more assists, and Rooney went on a rampage scoring 8 headed goals in a row. Rafael’s skill and ability to use both feet meant that he could run between the full-back and the centre back, and with Valencia staying on the touchline that space would be massive. Rafael started to pick up assists and got a goal himself against Wigan, and since then the partnership has never stopped blossoming. Last season it was Fabio who came in and took over the right back spot, helping each other out exactly like his twin brother had. Being the more disciplined of the two Fabio did not attack as much, but he did exactly enough for Antonio to get more space. Chelsea, for example, never managed to double up on Valencia and had Chicharito not missed headers from 5 yards out he would have had himself one or two more assists. In games against Chelsea, Schalke and Everton, Fabio made runs dragging the left winger with him which put Valencia in one-on-one positions more often than not. Fabio would make a lot more narrow runs than Rafael, and Valencia got closer to the 18-yard box than usual leading to goals against Fulham and Schalke. What both twins have in common is that they run on the inside of Antonio and pick up that space, giving him freedom to get wider while they get in the box themselves. Both Fabio and Rafael have had a torrid time with injuries this season, but they seem to feature more often than not when Antonio is playing. In games paired together this season Rafael has gotten assists against Liverpool and Blackburn, while Valencia stands on 5 assists and 1 goal, and could easily have had more when they both tore Bolton to shreds at Old Trafford. Rafael made runs on the inside whenever Valencia got wide, on his outside when Antonio took part of the passing game inside, but most importantly Rafael took over as the right winger whenever the Ecuadorian decided to stay down, and exactly that is vital for United. With the Da Silva twins’ recklessness in attack the team needs the right winger to help out defensively, and having featured in right back himself a few times Valencia knows how to defend. Neither Liverpool, Blackburn nor Chelsea managed to create a solid attack down United’s right-hand side, with both players doing the defensive work marvellously. Nani is very different to Valencia, despite both looking strongest when played on the right side. The Portuguese magician is a more narrow winger, and despite being a great crosser of the ball he likes to cut inside more often than not. Nani does his work better when he is attacking the area between full-back and centre-back, and to do that he needs a full-back who can get on his outside. Rafael and Nani have been paired together many times before, but more often than not it leads to frustration for one or the other. Both Da Silva twins attack the area where Nani is at his strongest, so that combination is very rare to see these days. Nani had an awful season in 2008/09, most people blaming the “second-season syndrome”, but in hindsight you have to wonder whether it was because of breeding the Da Silva’s. Against Spurs in April that season, United went 2-0 down at half time following some horrible defensive play by Rafael, but it was Nani who went off at half time at the expense of Tevez. What happened afterwards is as they say, history. Ronaldo changed from left-wing to right, Rooney took over for the greasy one, and together the two of them came up with four goals and three assists. United finally managed to attack down the right, and despite not getting an assist that game Rafael looked in his right mind. In the 2009/10 season both Nani and Rafael started poorly, with the Brazilian making mistake after mistake when paired with Nani. The Portuguese did not impress himself until January, but when both Gary Neville and John O’shea returned from injury Nani produced his best form. Nani got the freedom to cut inside knowing that the two elders would always get on his outside and give him the width required to attack his favoured area. That would continue into the next season, when Nani stared the season in blistering form. Goals and assists came his way, and we finally saw the best of him. He would of course be paired with Rafael or Fabio in that season, but it did damage to United more often than not. Losses against Liverpool and Wolves came when both of them started, but with O’shea Nani looked at his best. With Neville retiring and O’shea leaving in the summer of 2011, Ferguson had to look elsewhere to find a right-back who could bring out the best of the Portuguese. In game Phil Jones. Add to that, Chris Smalling was pushed out of his favoured central position to cover the right-back at the start of the season. Very much like a right-back O’shea, Smalling did his job quietly and created a great understanding with Nani. Whenever Nani got wide Smalling would stay back and help him out, instead of running past him like Rafael used to. Following orders to perfection, Smalling made a good right back helping out wide and dragging the left winger outside if Nani got inside, and goals against City, Arsenal and Chelsea followed. Then came the game against Bolton, and the Nani-Jones partnership revelled! Together they picked up 4 assists, and the opposition had no answer. Jones would make unorthodox, chaotic runs which are actually too narrow for a full-back, which Nani took full advantage of. Phil, attacking the left centre back in an area that put Robinson in full confusion of whether to get inside or cover Nani, gave the Portuguese more space to expose. He could start out wide, start on the inside, Phil had all the ingredients that brought the best out of Nani that day. Getting on the outside of Nani is vital, and Jonesy’s movement fits him brilliant. If he does not get narrow, the young Englishman would stay wide and pass back to a Nani on his inside who has enough space to swing a ball in like he did for Scholesy against Norwich. There are certain situations in which you can see if a partnership works, and just like Smalling Jones would stay back and cover Nani if he was under pressure. Rafael would run past, as Valencia tends to make wide runs that opens up space in behind. Staying deeper than Nani in those situations, Valencia could pass it behind the pressured area into Rafael, whereas the Portuguese stays high under pressure and needs deep cover. Jones offered exactly that. Nani has since been taken over to the left, where has had to cope with Evra or Fabio. 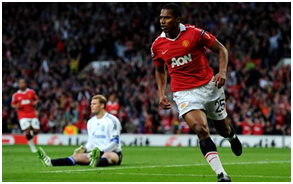 Both those two are very similar, in that they make inside-runs and do not cover too much, and Nani’s play has suffered. Nani will help out defensively, not as well as Valencia as he is more of a tackler. Valencia will stay and cover space, leaving the tackling to Rafael, whereas Nani will be aggressive. With Evra’s positioning, that is dangerous. Defensively Nani-Smalling has looked the better than with Jones, as Phil is very aggressive himself. As soon as Phil gains more experience, that calmness and positioning will come. It is common knowledge that Ji-Sung Park is a “defensive winger”. The South-Korean is a workhorse, a dedicated professional who will do his utmost to pressure opponents. He may not be the most skilled footballer on the planet, or have the crossing ability to make a brilliant winger, but his ability to pick up space makes him a vital asset attacking wise. Defensively, he is a God-send to Patrice Evra. Most people probably know that the two of them are best mates off the pitch, very much like the footballing world’s answer to the “Rush Hour” movies, and it shows on the pitch. Offensively their understanding is top, and defensively United become a much greater defensive force with those two. Park’s ability to pick out space helps his defensive play, as he always seems to be in the right position to cover for Evra. Patrice’s positioning is very reckless for a full-back and he often flies into tackles, but with Park around it does not get punished as severely as he always seems to cover. Unlike Nani on the left, Park is more composed and will intercept rather than tackle inside his own half, very much like Antonio. 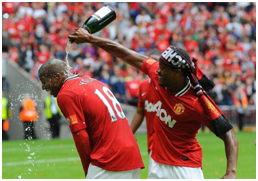 Evra’s best form for United has come with Park on the pitch, and when they both played regularly in 2008/09 United managed to pick up a Premier League clean-sheet record despite having the likes of Rio Ferdinand injured for most parts of it. That continued in to last season, with United remaining undefeated until February. Offensively they work well together, with Park not being the best of crossers he tends to like quick, interchanging passes which is one of Evra’s fortes. If attacking from the deep, Park will stay wide and play it to an onrushing Evra coming on his inside, and if attacking high Evra will stay wide leaving Park going on the outside. You cannot sense which is the winger when they attack, as both fly in all directions, but if Park is wide Evra will come from the deep and smash a low ball in. Off the ball, Park uses his stamina to press high when oppositions try to start an attack. Tackling wise, Park is a beast in the opposition half, but when they get past the half-way line he will try to intercept it. He is very much like a third central midfielder when playing there last season, and it brought the best out of a central-midfield Giggsy. The Welshman would get on his outside, Evra on his inside, and all three became a potent threat for United in the latter stages of the 2010/11 season. Those three have a brilliant connection together, even defensively. Park will get central, forcing opponents wide to Evra, only for him to pop up and cover when they attack the Frenchman. Park has not featured often this season, but whenever he and Evra have been paired United rarely concede. Evra had a shocker against Swansea, but thanks to Park’s heroics United managed to keep a clean sheet. They stopped Liverpool completely at Anfield, and had it not been for two set-plays United may well easily have gotten the rewards for totally dominating the reds at their own ground. When Sir Alex purchased Ashley Young this summer, he must have thought “Where can I find a player like Park, only with attacking qualities”? Because that is exactly what Ashley offers. Defensively, he if very similar to Park. He is not a tackler, more of an interceptor who covers for Evra whenever needed, and despite not possessing Park’s stamina his dedication to the cause is just as good as the South-Koreans. Despite a minor blip against Manchester City, the two of them have guarded United’s left side well when paired together this season. When under severe pressure, Evra can tuck inside in defence and leave Young to take care of the opposing winger/full-back, while on counter attacks Young leave Evra with the winger and position him to cover, or if up against a slow right-back stay close to him and put United in a good position to counter down that side. Offensively the partnership has blossomed, with Young offering very much the same as Park does only to add some pace and dangerous crossing. Ashley will stay out wide and hug the touchline, and play quick interchanging passes with Evra who runs inside. When attacking with pressure Evra will attack the area the same area as Jonesy does on the right, between the centre-back and the right-back, opening up room for Young to get closer to the box from his wide position. The English winger prefers to get the ball over on his right, turning inside, and with Evra around he gets greater options. He can pass it back, play it behind for the overlap, or fake a pass and get inside as he did against West Bromwich. Thanks to Ashley’s diversity he can work as a left-attacking midfielder as well, taking up Wazza’s position if he decides to get closer to midfield, or in the box, putting him the space to take a shot like he did against Spurs and Arsenal. It has become a potent threat for United down the left-hand side, and their movement and understanding is very much like Valencia-Da Silva on the right. Full back getting on the inside, winger staying wide and swing in a dangerous cross. Their understanding led to a winner against Norwich from Giggsy, and boy may it prove vital! Young is still very raw, and despite being new to United his partnership with Evra has already blossomed. Evra has already made two assists to Ashley this season, and some brilliant movement by the two of them put Richards on his bum in the Charity Shield against City. Young-Evra is our biggest strength down the left, while the right wing should either be Nani-Smalling/Jones or Valencia and either Da Silva twin. It seems to bring the best out of the players, and has lead to multiple United goals down the years. Long may it continue! 1. Because of the things mentioned in what makes a good full-back to Nani, Valencia has done a good job there. He gets on his outside, and is careful going forward under pressure. He is also pretty calm and doesn’t sell himself going into tackles, which makes a good mix with Nani. 2. Evra has made 8 assists this season, 5 of which have come when Young has been on the pitch. 2 have come when Park was the left winger, and only once has he gotten an assist with Nani on the left flank and that was for Welbeck’s volley away to City in the cup.